With the slow accent of spring, I was ready for a change from my traditional crock of sauerkraut and looking to ferment something a bit more bright and lively. 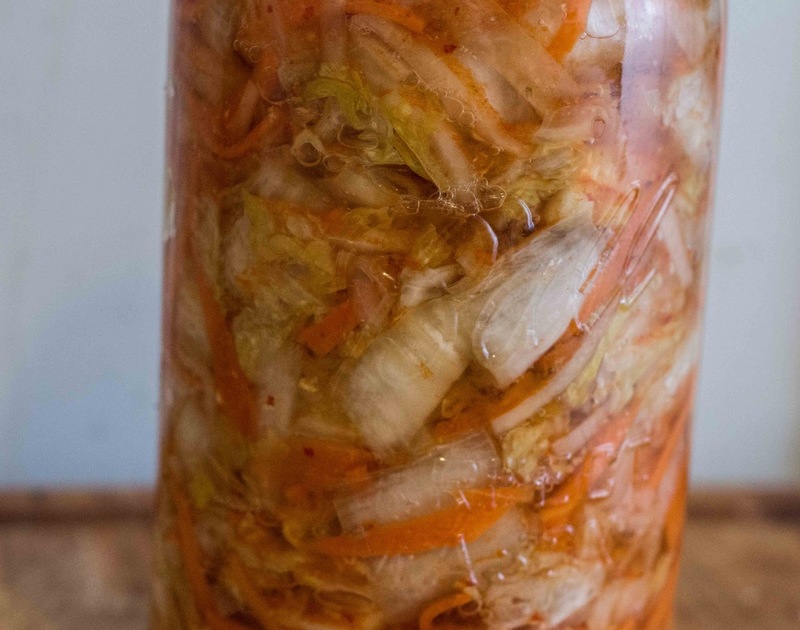 So I turned to kimchi, the classic preparation of cabbage slathered in garlic, chile paste, and ginger, then fermented like you would sauerkraut or many other pickles. Kimchi is an ubiquitous part of every meal in Korea, although I never quite got used to eating it with breakfast. But it's not that different from slopping Tabasco over your breakfast eggs and potatoes, so I've slowly come around to the idea. First off, let me say that making Kimchi is really easy. It's like making sauerkraut, but with more seasoning. But second, there are a ton of bizarre recipes for kimchi floating around out there. One included soy sauce, which seemed like it would make for a very dark, murky kimchi. Many included sugar, which also seemed odd to me. The amount of sugar varied wildly, from a teaspoon to a half cup. Even my beloved Momofuku's recipe suggested tossing one small napa cabbage in two tablespoons of sugar to marinate, and then adding a half cup of sugar to the brine! Slightly bewildered, I called in a pro. 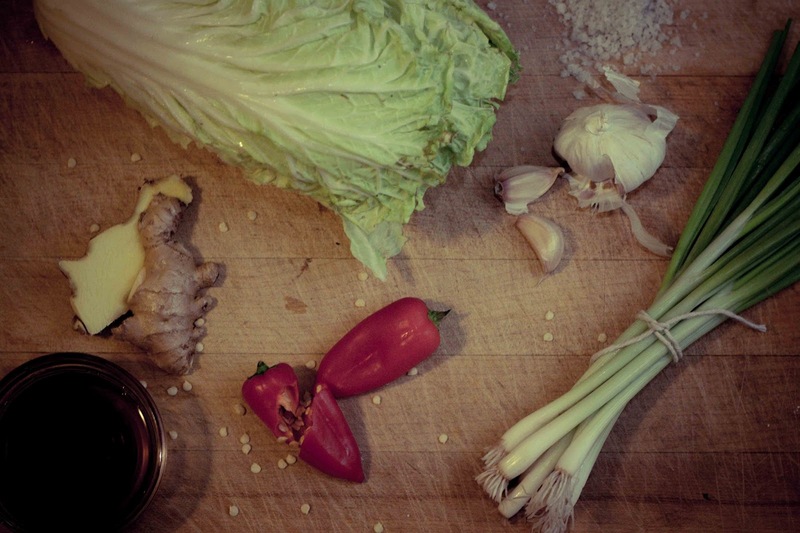 My sister Youngjoo gave me tons of advice, from her own kimchi making and her mother's recipe. You might remember the totally awesome kimchi-dedicated refrigerator her mother owns. Youngjoo found both the sugar and soy sauce to be a bit odd, and suggested for sweetness I could puree sweet onions and use them in my kimchi. She also recommended an addition of white daikon radish, which would help cut the spicy/funky flavor of the chilies and fermented cabbage and add a refreshing flavor and crunch. Another step that separates kimchi from sauerkraut is the addition of cured seafood in some form. Most of the actual fermentation comes from letting the cabbage break down and produce lactic acid, but extra zest is added by including fish sauce (the run-off from anchovies cured in salt), salted shrimp, or raw oysters -- although those are only used in winter. For this batch, I just used the supermarket staple of Squid brand fish sauce. I did take a bit of artistic freedom with the chilies I found a sack of beautiful, fruity, fiery Fresno chilies, which are my favorite hot peppers hands-down. Sadly, I haven't had much luck in drying them or making a hot sauce from them...they just become a bit tame and one-dimensional. But always one to throw in some more untested variables, I pureed six of them to make my chile paste. Two weeks later and the kimchi is shaping up into a beautiful, zesty cauldron of fermented goodness. Now that it's right where I want it, flavor-wise, the jar will go in the fridge to slow down the fermentation. It'll still ferment and get stronger, softer, and sharper, but the fridge should help keep it in the sweet-spot a bit longer. Time for a kimchi dog!